Vanderbilt Cup Races - Blog - Original Survey Maps of the Long Island Motor Parkway Discovered! Over the last 80 years, the survey firm of Barrett, Bonacci and Van Weele has acquired many Nassau and Suffolk survey firms, including several which conducted work for the Long Island Motor Parkway, Inc. Within their historical files were 572 survey maps of the Motor Parkway dating from 1907 to 1985. These maps will be posted exclusively on VanderbiltCupRaces.com over the next year. The first survey map shown is Old Bethpage/Melville land conveyed by Harry W. Clody to the Long Island Motor Parkway, Inc. The survey was conducted in November 1907 by C.P.Darling. The current location of this land is north of Spagnoli Road and west of Route 110 in Melville. Most of this land is now owned by the 110 Sand Company and closed to the public. 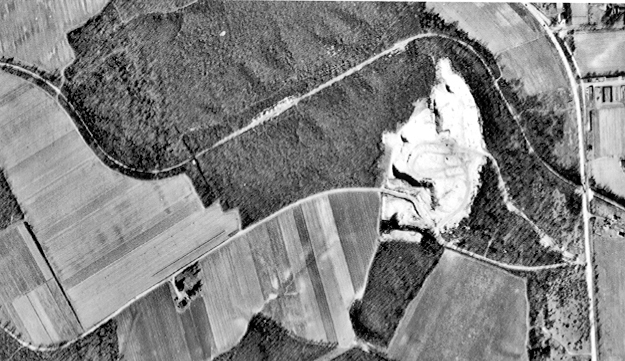 This is a 1950 aerial of the same area from my photo collection. Route 110 (Broad Hollow Road) is running north/south to the right. Note the location of the Long Island Motor Parkway Bridge which had already been torn down. Wow - what a find; can’t wait to see more!!! incredible stuff.grew up in Northport,went to Dowling a bit,miss it all. Springfield Blvd. ,Queens County going into Ally Pond Park.Is it still there and had been used by Bikes and walking? west to east. Remember long hill at Springfield Blvd. Bridge over same. Alley pond.